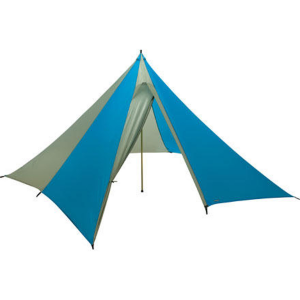 Light silicone coated polyester panels held together with sewn tape edges and ridge line make this tarp an easy to carry, yet sturdy shelter. Well designed and constructed by a self described cottage company located in Michigan well known in the hammock community for their quilts. 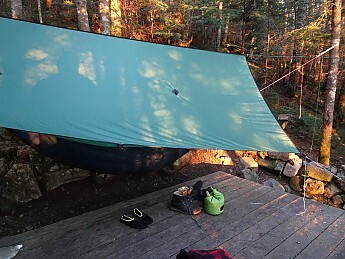 Drying out after a storm at the 13 Falls camp in the Pemi with some laundry on the line. Underground Quilt (UGQ going forward) is a small cottage maker of quilts and other hammock centric gear based in Jackson, Mississippi. Like many small makers they are constantly updating their line of made to order items. 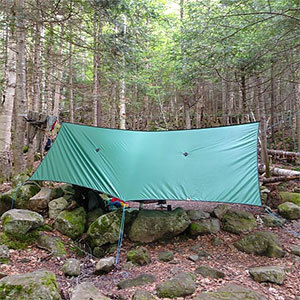 This review is for a tarp they no longer have available on their site, but will give you a look at the quality and craftsmanship UGQ is known for. 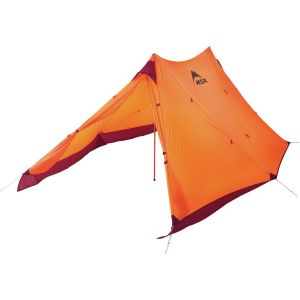 This tarp is also the same "rectangular cat cut" that they currently offer in their XL line of wider tarps. Closeup view of the material, external on the left side. Also note the continuous tape forming the corner loop. 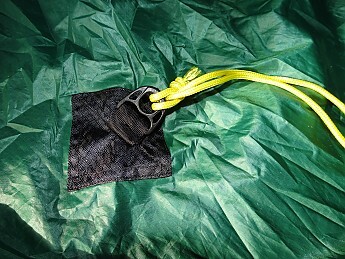 The 20D silicon coated ripstop polyester material is listed as a 1.1oz weight. It looks and feels very similar from either side. Despite the lightness this fabric is very stretch resistant when compared to nylon based fabric. The SilPoly material also repels water making it lighter if it does get wet and faster to dry when given the chance. Ridge line tie outs are sewn over the top of the sewn ridge line distributing the tensions without stressing the SilPoly. 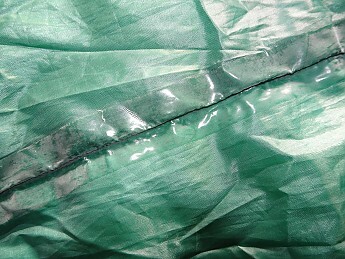 The edges and ridge are all sewn with a 3/8" tape giving the tarp a strong frame. Stitching is very well done throughout and all materials are well trimmed. 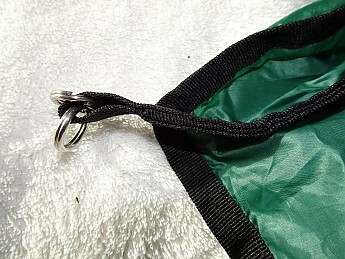 The perimeter tie out loops all came equipped with sets of tiny rings which can be removed if preferred in order to save weight. Left in place they can be used to secure a line and make a great spot to hang a Dutch Hookworm (review coming soon). 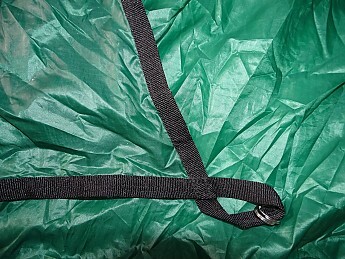 Closeup view of the interior of the ridge showing the bottom stitch and the seam sealing. Given the cost of only $13 I added seam sealing to my order. UGQ says it isn't really necessary to seal the ridge assuming a taut pitch, but I ordered side pull outs that did need sealing so had them do the whole job. Again the attention to detail was obvious and the sealant remains perfect after almost a year of use and abuse. Carefully suspended over some fallen logs near the Baldpate Shelter on the AT. The very slight catenary cut shows a bit in the pic above, but can be hard to notice if you aren't looking for it. That shaping helps in getting a taut pitch even in a site like this. It also helps direct stress to the tie out points. Being so slight it doesn't increase exposure very much. Side pull out with "pole mod" attached heh. The optional side pulls add function at the cost of some weight. They are very well sewn onto the face of the tarp making them a secure attachment point for a tie out. I have primarily used only the ones on the head end of the tarp. Loops of cord combined with a hiking pole over the top of the ridge lift the sides up and out leaving me with a lot more breathing room inside. 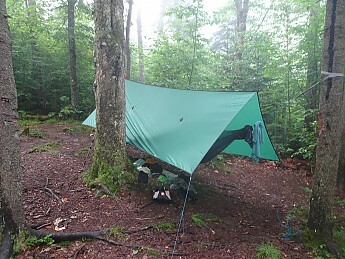 Hanging at the Liberty Springs site along the AT on the first night of a June Pemi Loop. 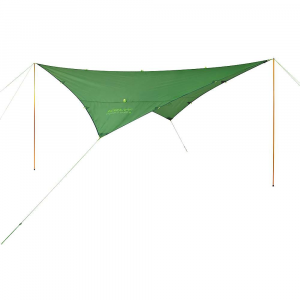 I used the UGQ tarp on all of my hammock trips this past year until the snow fell. It arrived in May last year and once the mud dried up enough I was out stomping around Maine, New Hampshire, and Vermont. Conditions ranged from darn nice to ugly wind and rain as one might expect. 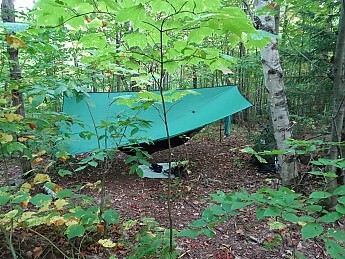 Nestled under the birches near Journey's End camp at the start of an ill fated SOBO LT thru. 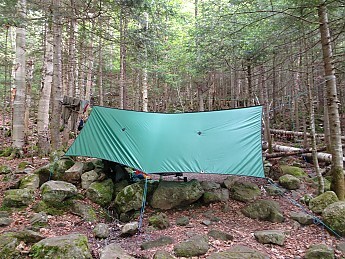 This tarp rocks! I try not to hand out 5 star reviews unless a product really is that good, but I couldn't find negatives to warrant taking anything away from the folks at Underground Quilts who put this thing together. Materials and craftsmanship are top notch. The stitching is even and level throughout. 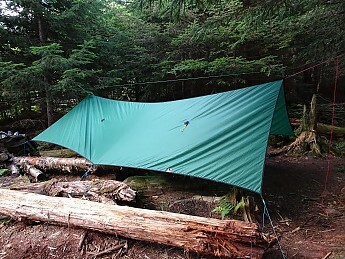 The design is also part of why this tarp worked well for me I think. The slight catenary cut made it easier to get a good pitch even when working around obstacles that prevented a stake from going where logic might dictate. Looking closely I appreciate the way the perimeter tie out loops are made from the continuous edge tape. They can't pull apart because they are all one piece. That seems a great way to transfer the stresses a good wind can put on a tarp and guy lines. The only negative things I can say are listed in the Cons above. The material doesn't like being crammed into a tiny stuff sack and shows lots of wrinkles when first pulled out if left in there too long. UGQ is also pretty popular, so you may have to wait when you place an order. Quilts seem to get backed up more than tarps, but there was about a four-week delay between order and shipment when I bought this last year. The morning after a long wet day on the Grafton Loop. Darn happy to get under that roof the night before!! 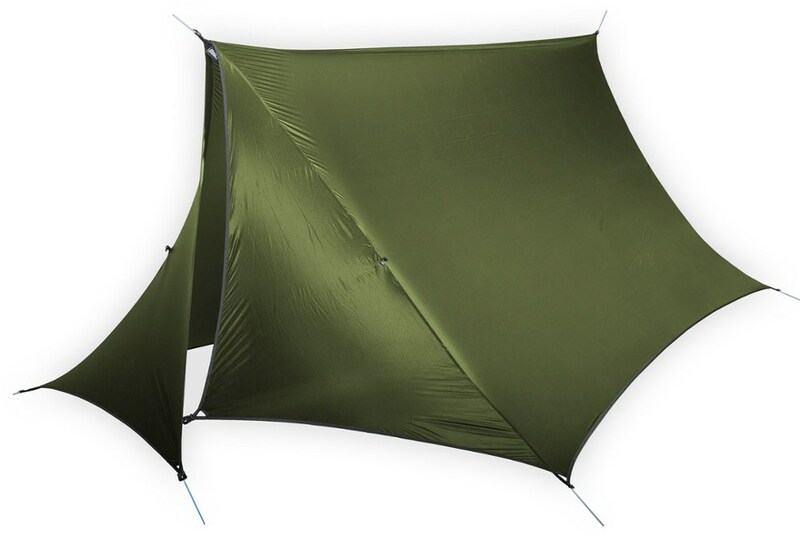 Those looking to cut weight could skip the side pulls and take off the metal rings and those really looking to cut weight could look at UGQ's tarps made from a lighter weight, 15D .93oz SilPoly. Given the places I go and the weather I encounter I felt this weight was my best bet. I have no question that I've gotten value for my dollar already from this purchase and I expect to be using this tarp for years to come. 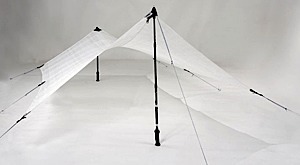 While this specific tarp doesn't seem to be on their menu any longer, I feel confident recommending Underground Quilts as worth looking at if you are in the market for a tarp based on their workmanship and attention to detail. Nice review, LS! Thanks for taking the time to share it and your pictures. Wow that is one nice looking tarp. Thanks for making me aware of them. @Patman They were an early adopter of the SilPoly which is why I ended up ordering this one and their sewing rocks. Look at the hex tarps if you want minimalist style because the only rectangles they are making now are really huge 12' wide models. 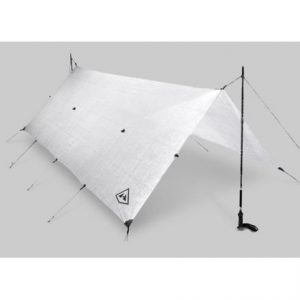 The UGQ SilPoly Rectangular Cat Cut Tarp (10x12) is not available from the stores we monitor.